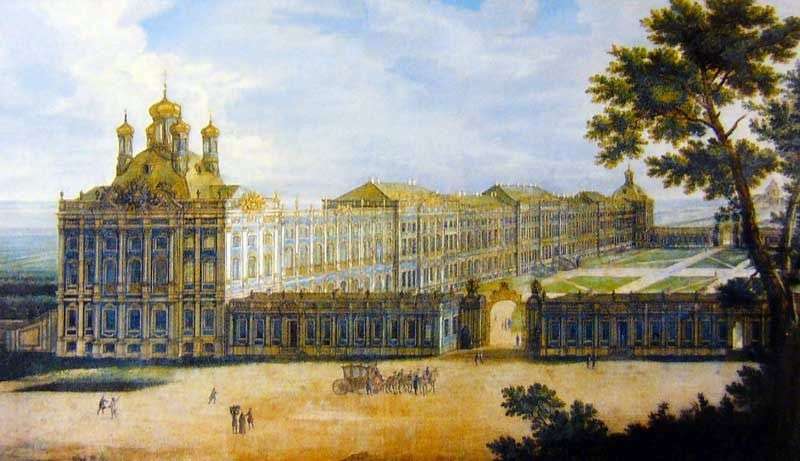 The Great Palace of Tsarskoe Selo is depicted by F. Barizen from the side of the church, and she was given special attention to the master: the Empress Elizabeth Petrovna showed great interest in the construction of the church: she wanted to make the eye in the summer residence pleasurable. The Church of the Resurrection was consecrated on July 30, 1756 and was five-domed. The Empress hurried the builders and more than once came to Tsarskoe Selo to make sure of the quality of their work. The composition of the picture created by Barizien is very spectacular, the palace on this canvas looks monumental and significant, a good perspective of the building: an open gate leading to a wide courtyard immediately attracts attention. The play of light and shadow on the bizarre details of the facade, the ease and ease of the overall solution and composition give this product a program character. Description and meaning of the painting View of the Grand Palace by Friedrich Hartmann Barizien.